The CRUTEM4.6 weather station data for June 2018 has just been published, which when combined with the HadSST3 sea surface temperature data forms the global average – HadCRUT4.6. The traditional method for calculating this is by binning all the station data onto a 5 degree (lat, lon) grid and then forming the area weighted average over all populated bins. HadSST3 is already published on a 5×5 grid. The MetOffice/CRU result for June is a temperature anomaly of 0.57C, down by 0.03C from May. I calculate the global average differently, by forming a 3D triangular mesh of all measurements over a spherical surface. The vertices of each triangle is one individual station or one individual SST value. The temperature of every triangle is taken as the average temperature of its 3 vertices. The global average is the sum of all triangular temperatures weighted by their area.The area of each triangle depends on the density of temperature measurements. 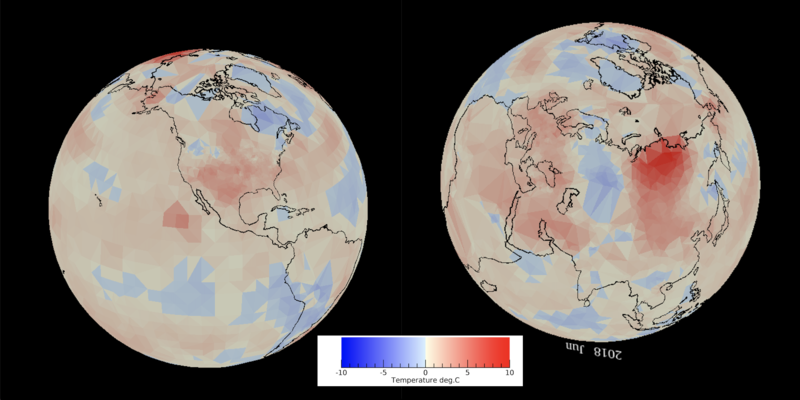 The main difference to using a 2D (lat,lon) grid is that all the earth’s 3D surface is sampled, including the poles. Cowtan and Way cover the full 2D surface by using a 2D kriging interpolation to extend HADCRUT4 data into polar regions . I think my method is neater because the only assumption made is that the earth is a sphere and has a well behaved temperature distribution. Both methods agree almost exactly, as we shall see. My result for June 2018 is 0.66C, which is up 0.05C from May. 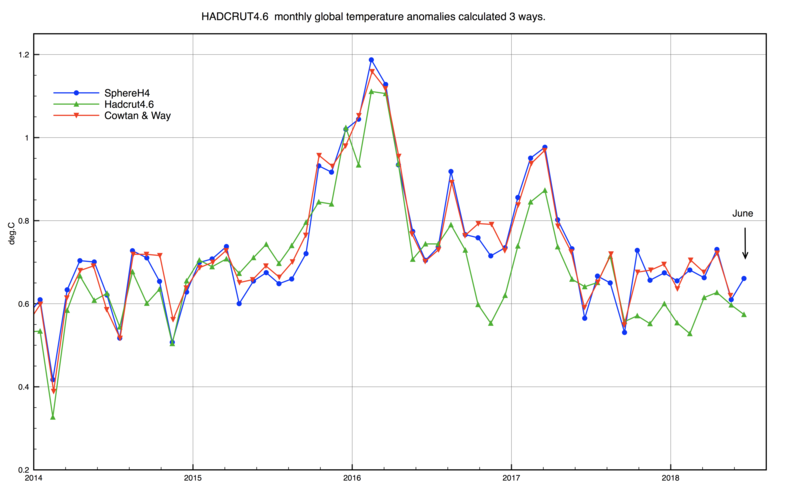 Comparison of 3 different methods of calculating the HADCRUT4 global monthly average temperature anomaly. There is an almost perfect agreement between the spherical triangulation method and Cowtan & Way, (they have yet to publish their results for June). Shown below are the 3D spatial temperature distributions from the spherical triangulation. Antarctica (in winter) was warmer than normal, but the rest of the southern hemisphere is about average or cooler that the ( 1961-1990) normal. The most noticeable feature globally is the strong hotspot over northern Siberia with warmth passing across the US, the Atlantic and Europe, while Northern Scandinavia, Greenland and Labrador are much cooler than normal. Temperatures across Northern Siberia stretching south as far as China are up to 10C warmer than normal. The heat waves over Europe, the Middle East and North Africa look almost minor in comparison! The Pacific is shows a weak la Nina pattern, while South America is much cooler than normal. The large scale picture of a gradual warming trend of course remains the same. 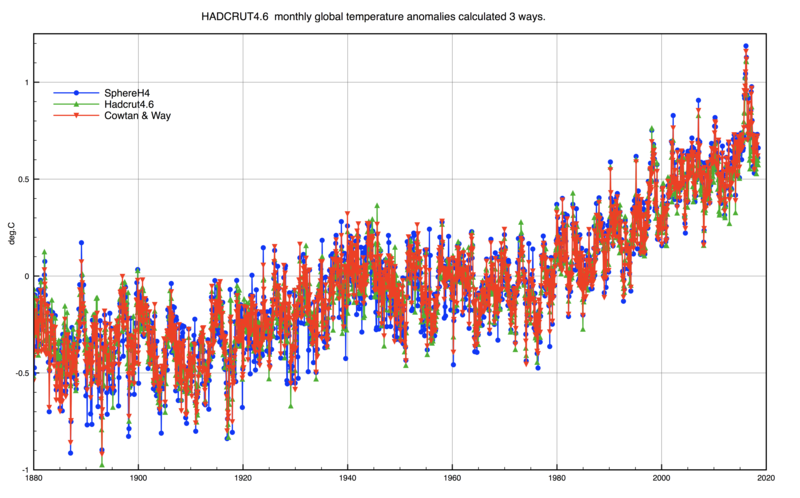 This entry was posted in AGW, climate science, UK Met Office and tagged AGW, Climate Change, Hadcrut4. Bookmark the permalink.